In August, I painted a couple of pear tree canopies, based on the trees in our backyard. I like the romantic feel of these and the spare, pastel palette. Both have found homes, but I plan to paint a few more. Since August, I've been painting wildfires. I think of 2017 as the year the West burned. These paintings are a response to the fierce beauty and power of fires as they move across the landscape. Politically and culturally speaking, 2017 unfurled with the same intensity, tearing through customs and institutions with destructive, unpredictable force. Oil on canvas, 20 x 30"
Oil on canvas, 30 x 30"
Oil on canvas, 20 x 40"
Oil on canvas, 40 x 30"
I like to support Gage Academy of Art whenever I can. I learned so much from their classes, workshops, and instructors. This year, I'm honored to share that Yellow Poplar, my donation to the 2017 Gage Annual Art Auction, was selected by the Golden Ticket Winner! MyTwo Wolves limited edition print has been very popular. I love seeing it framed and hung in collectors' homes. I'm delighted to have my painting Snoqualmie included in a Tammara Stroud Design interior. I opened my studio last Saturday for a Holiday Sale. Thanks to everyone who came out to visit. We've put together a stellar list of artists for this year's event including: Juli Adams, Zeynep Banu Alev, Crystal Barbre, CASH, Casey Curran, Julie Devine, Jessica Dodge, Braden Duncan, Galvanic Games, Aaron Haba, Gabriel Marquez, Hanna Myers, Kemba Opio, Kyle Rees, Erika Rier, Sara Takako-Skinner, Mackenzie Stratton, Robin Walker, Casey Weldon, Leslie West, Daniel John Williams, and Junko Yamamoto. I have a few paintings up at West Elm Seattle this month. Such a beautiful environment! The colors are perfect. 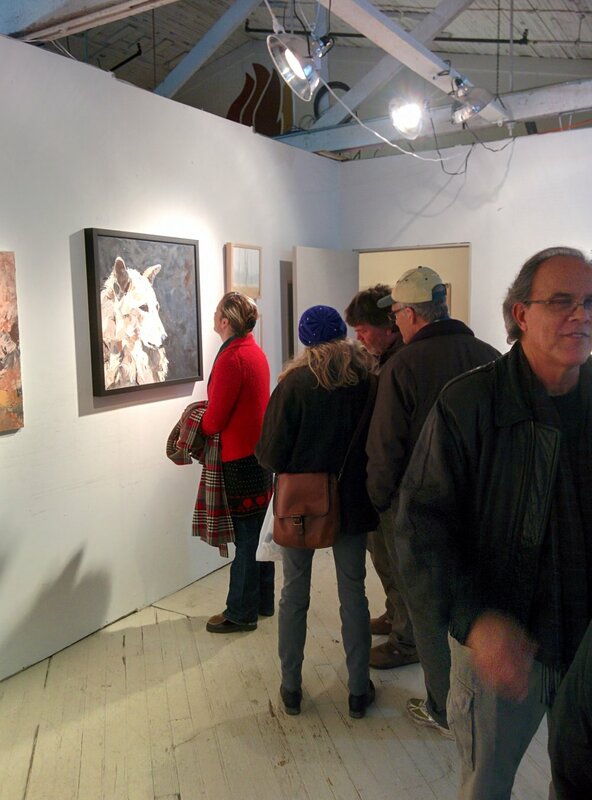 I am showing Iskra, one of my new wolf paintings at Sassafras this month. I enjoy hearing people's comments about his expression and fur. Displayed with Iskra are several landscapes. All are in a limited neutral palette, much like the PNW-designed jewlery and garments in this beautiful dress shop / maker space on 2nd and Bell in Belltown, Seattle. Iskra and The Pass, both oil on canvas, 30 x 30"
I love working in this neutral palette. Smaller landscapes in acrylic or gouache are also on view. Sassafras offers a large selection of unique jewelry designed and crafted by Pacific Northwest artisans. 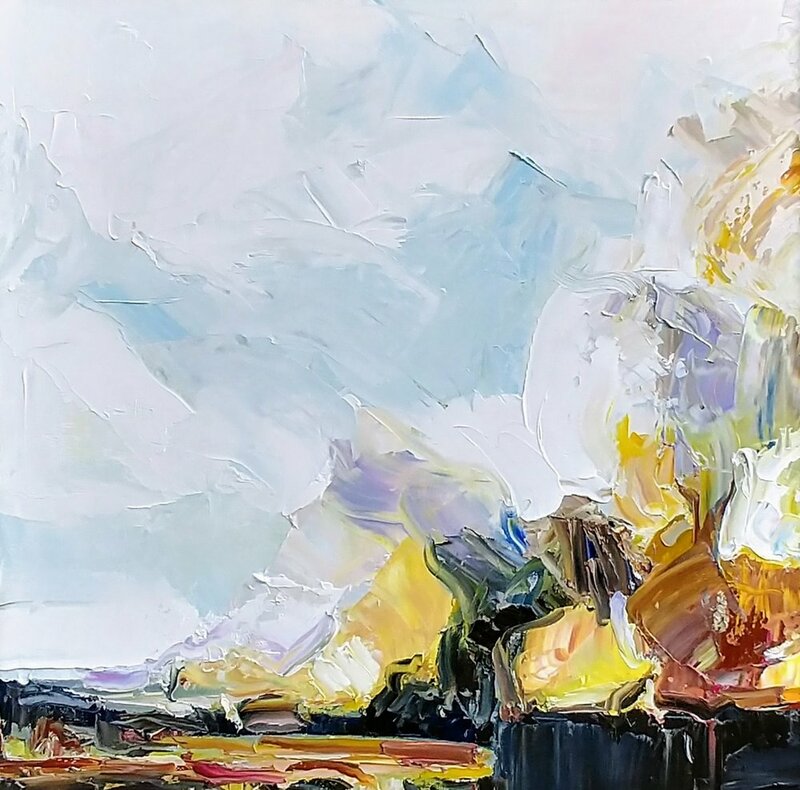 Julie Devine, Gravity, 2015, oil on canvas, 40" x 30"
Julie Devine, Chaos and Landscape, 2013, oil on canvas, 15" x 30"
I had a nice time at the Spring Art Show at Gray Sky Gallery. Thanks to everyone who attended! It was great to see you. I am happy to share that I have a piece in this upcoming show in San Dona di Piave, Venice. ArtExpo 2015 opens June 6th. Asian Pear is an ARTslanT Showcase Winner! I had a great time at the Gage Academy of Art annual gala. Giving back to Gage feels good! 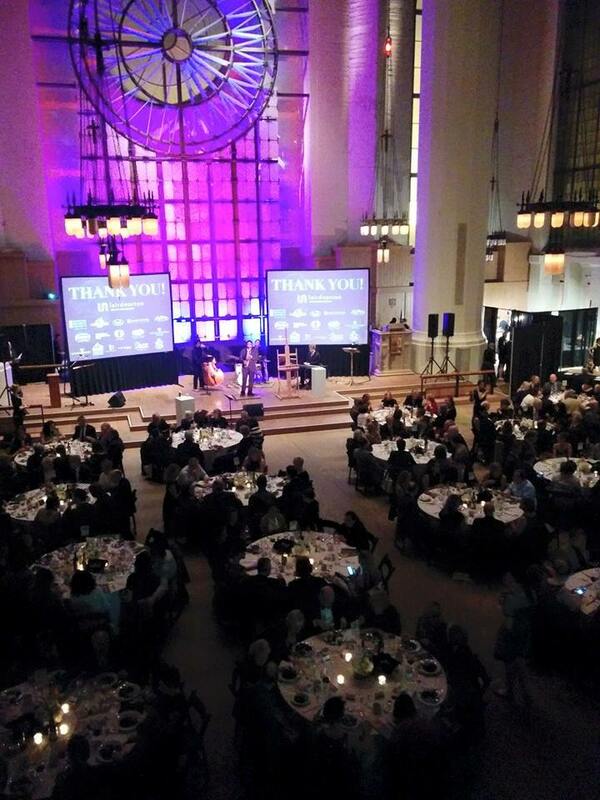 The gala was held at Saint Mark's Catherdral, Seattle, WA. 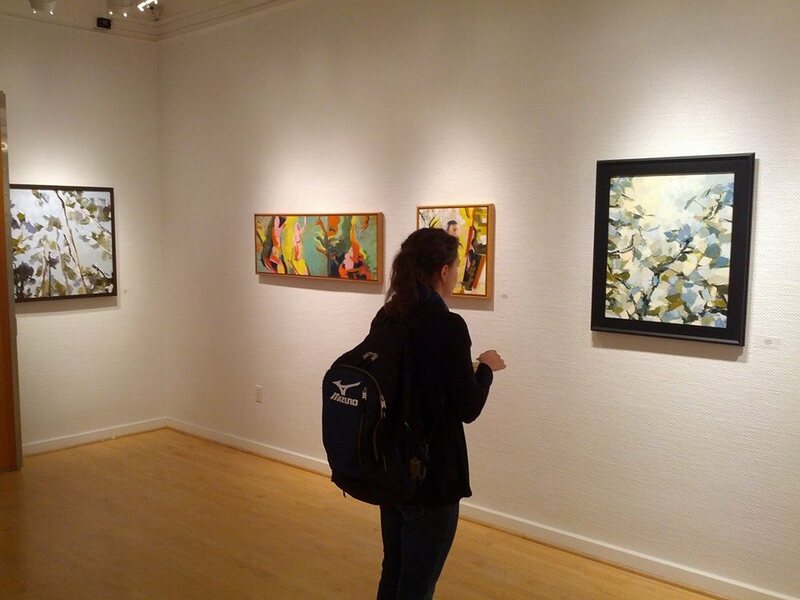 I had a nice time visiting Western Oregon University for the Degrees of Abstraction show. The gallery was beautifully curated by Paula Booth.